Grow wildflowers in the garden and you’ll get a tapestry of colour and texture - from the soothing blues of cornflowers to the deep reds of poppies. Just let them flower and go to seed, and watch the next generation of flowers come back next year. 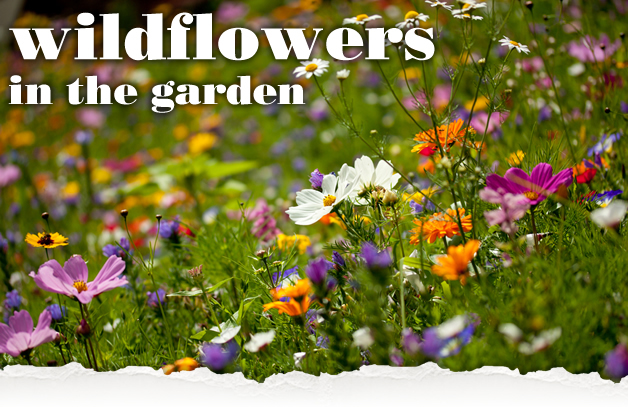 Wildflowers are colourful, pretty and dainty and definitely worth adding to your garden. By choosing just a small patch in your garden to hand over to wildflowers, you’ll be doing you’re bit in reversing the loss of wildflower habitat too that has seen a devastating 90% loss since the 1930s. Collectively gardeners and gardens can make a real and rewarding difference in conserving wildlife, just by planting some wildflowers. Attract butterflies and beneficial insects – The often simple flower structures of wildflowers provide easy access of all-important nectar and pollen to bees and other insects like lacewings and ladybirds which prey on unwanted pests like greenfly. Add animation to the garden – it’s not just colour that wildflowers bring to the garden. Wildflowers bring the garden to life. They’re a magnet for bees and butterflies on the wing and you’ll love watching these busy creatures at work. Encourage more wildlife into the garden – Bringing beneficial insects into the garden, brings in bird-life, adding more life to the garden. You’ll get a great feeling of achievement doing your bit in provide native animals with food and shelter. Naturally produce lots of seeds – Wildflowers are naturally prolific, and programmed to attract insects, be pollinated and set seed for the next generation of flowers. It’s this continual generation that means you’ll enjoy wildflowers year after year. As the creator of wildflower areas, you can choose wildflowers to suit your taste. You might want to achieve the romantic look of an English meadow or have wildflowers that are particularly rich in pollen and nectar. Alternatively you can choose flower mixes that focus on a particular colour range. Bright mixes make a bold statement, including pheasant eye, toadflax, miniature sunflowers and poppies. While pastel mixes are softer in colour and include delicate varieties like corncockle, candytuft, nigella and phacelia. Choose your mixes to suit your taste and the character of your garden. So mix and match your favourite flowers and create beautiful wildflower displays in your own garden for you and wildlife to enjoy each year.